Priorswood is a mixed tenure estate of 212 non-traditional Woolaway homes, mostly owned by our client Taunton Deane Borough Council. Woolaway homes’ construction is now considered a defective form according to the 1984 Housing Defects Act. As planners and architects, our task was to lead an option appraisal process to find a strategy to resolve the structural issues of these properties. Using information gathered from one-to-one consultations with over 90% of residents, we worked with the Residents’ Design Group to develop a range of house types to suit the current and future community. The purpose of the design group was to empower the community in designing options for the future of the estate. This gave the community representation and involvement in the decision-making process. To do this, we trained residents in design principles, technical issues and the planning process so that they could understand the project constraints. Members commented on the proposed layout and house designs throughout the process. Changes to the masterplan and dwellings were made following their comments. Through our inclusive process, we gained the support of many residents, who have gradually agreed design and delivery solutions for this sensitive project. Our transparent approach (supported by testing) has enabled the team to find positive solutions for the people living in the area. A Residents’ Charter has been produced for tenants and homeowners to outline commitments such as compensation, rights to returns, valuations and rents. 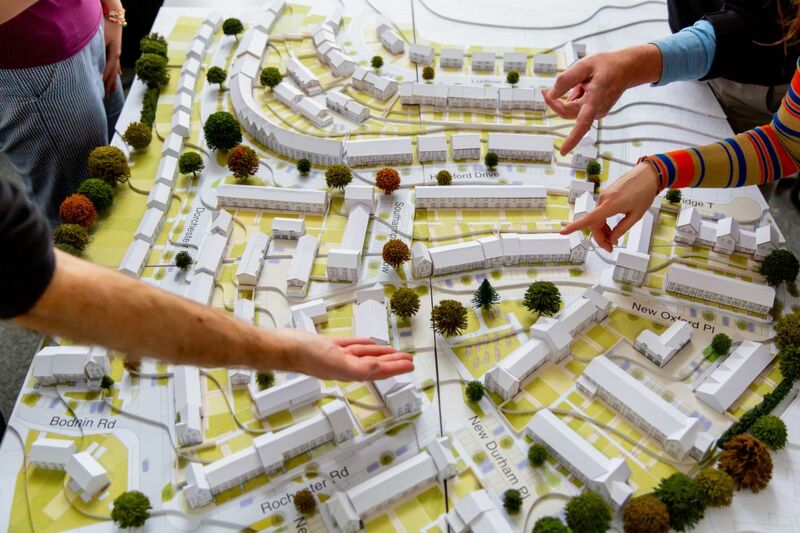 By working with residents as part of a community and consultation-focused approach, the project team has discussed how different solutions (eight options) could address the Woolaway issues and regenerate the local community. The community engagement process was described by the Design Review Panel as ‘rigorous and outstanding’ and an exemplar for future projects. As a result, we are replacing 162 Woolaway homes, refurbishing 60 Woolaway homes, providing 60 additional homes, a new open space and a community centre. The proposals have been submitted for planning and are awaiting approval.